Relax & Enjoy the Scenic Drive on Your Way to Visit Us! Take Interstate 17 North from the Phoenix area or South from the Flagstaff area. Exit Interstate 17 at Exit 287, Route 260 Camp Verde/ Cottonwood. Turn west onto Route 260 towards Cottonwood. Then follow “To Bent River Machine”, below. If you don’t mind mountain roads, drive on 89A over Mingus Mountain and through Jerome to Clarkdale, or take 69 out of Prescott to 169 to Interstate 17. Exit Interstate 17 at Exit 287, Route 260 Camp Verde/ Cottonwood. Turn west onto Route 260 towards Cottonwood. 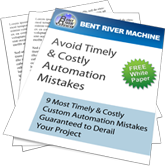 Then follow “To Bent River Machine”, below. From Cottonwood, here are the driving directions. We are off the well-traveled road. Go West on Route 260 [toward Cottonwood] follow this road for about 12.5 miles. At the intersection of Highway 260 and Highway 89A turn Left onto Hwy 89A/ Main St. Follow Main St. 89A will make a left at the next traffic light. DO NOT TURN here, go straight through the light and remain on Main St. This street winds through Old Town Cottonwood [4 miles] and continues on to Clarkdale. When you arrive in Clarkdale, you will come to a “Y” intersection. Bear right on Broadway [keeping the playground and ball field on your right]. Follow the signs toward the Verde Canyon Railroad. You will cross a one lane bridge. After the bridge you will pass by the Verde Canyon Railroad Station on your left. Just beyond the Railroad Station go around the curve and bear left at the “Y” onto Luke Lane. Cross the railroad tracks. Directly in front of you will be the gate to Clarkdale Metals. Don’t go in this gate, but bear left and continue down the gravel road. Go about a ¼ mile, and on your right you will see the large tan and green building with the Bent River Machine Sign and flagpole out front. Come in the front door where we are anxious to welcome you to our company!